The UK recycling and waste disposal Industries are currently negotiating with the MOD (Ministry of Defence) to store recyclable waste at MOD bases up and down the country. This situation has come about due to a number of reasons, both due to limited space, a glut of materials, and the economic situation. Landfill in the UK is running out rapidly. It is estimated that within six and a half years all the current landfill sites will have been filled. The Government and the waste disposal Industry are currently planning new sites, but this is a delicate process of land purchase and discussion and planning with local Councils and landowners. In a nutshell, there is limited space in this island country where we can dig holes and throw our garbage. The public is more aware of the need to recycle now more than it ever has been, with the consequence than more of the general public as well as businesses separate waste into recyclable materials, and take more care in using materials that are recyclable. This includes plastics, paper, cardboard, wood, glass, and some metals. In the case of plastics, many types of plastic are now easier to recycle, and much more of the plastic containers available on the high street has been recycled. There is a glut of plastics being collected by both local Councils in municipal waste collections, and by private companies who offer a similar service. Recyclable material is collected at local waste and recycling centres, and sold on to either the recycling Industry, or through middlemen, who collect and ship materials.The UK has sold many million tons of recyclable materials over the years to middlemen and contractors who ship it to Chinma, where the Industry has adapted itself faster to this economic need and opportunity. Other European countries also buy such material, but China has become the world's no. 1 purchaser and processor of such materials, and the contractors have successfully used shipping opportunities to get this system up and running. 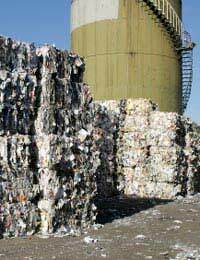 Due to the worldwide recession, which has affected every aspect of modern life, from shopping through to employment, the cost per ton of recyclable materials has fallen sharply over recent months. A ton of recyclable plastic for instance is now worth about a third of what is cost six months ago. This puts pressure on the collecting companies and Councils, as well as the purchasing contractors, and along with the glut of materials being collected on the doorstep, creates a build-up of materials at sites where the staff are struggling to deal with the workload. Contractors and materials collectors are turning to more profitable work during this current recession, so the collection of these lower value materials is given less priority. This situation puts pressure upon the collection centres, but the sensible solution, which the Industry is now exploring, is to seek further storage solutions, of what has been, and will be again, a valuable and lucrative material. Another option, much less appealing, would be to not separate recyclable materials and throw it all in landfill sites, but as already stated there is a looming problem with the landfill site, and this goes against the ethos of recycling. The Industry is now in negotiation with the MOD to store the recyclable materials, mainly plastics but possibly others as well, at MOD bases throughout the country. The advantage of this option is that most bases have surplus land, and sometimes hangers, warehouses and such like; they are always situated away from urban conurbations, and they always have very good transport links and infrastructure. The further advantage is that most material could be stored at a base safely and easily, and it could be stored until such time that the economic situation improves and contractors can pay more for the material, and the business of buying and shipping such material improves again.